Volkswagen's I.D. concept was unveiled at the Paris auto show. 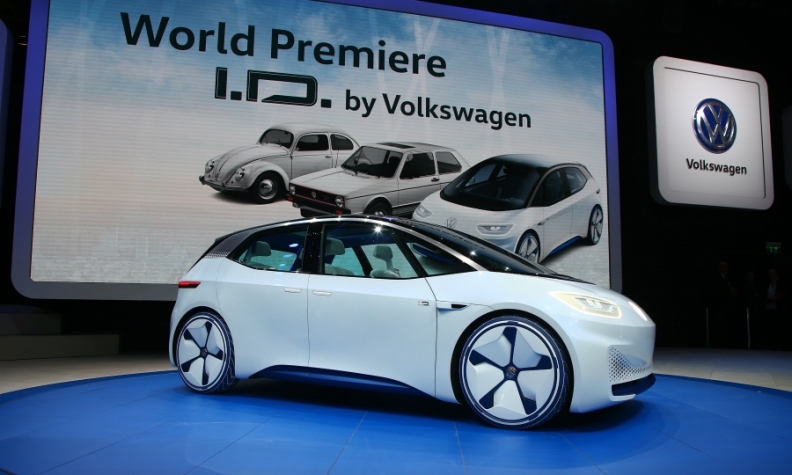 WOLFSBURG -- Volkswagen must have the first of its I.D. purpose-built electric cars on sale in 2020 to achieve CO2 reduction targets in Europe and China, company executives said. VW plans to approve in August the design of the first vehicle, a Golf-sized hatchback based on the I.D. concept unveiled at the Paris auto show in October. The automaker has already signed off on launching two additional models based on its new MEB modular electric platform. The second will be an SUV, planned for after 2020. A concept will debut at the Shanghai show next month. The third, a minibus with self-driving capability, was previewed by the I.D. Buzz at the Detroit auto show in January and is expected by 2022. VW brand CEO Herbert Diess said contracts to source the batteries have already been signed and his team is currently sourcing the components for a new electric/electronics architecture. "It's a very tight time plan for 2020, but we need the cars then to comply with our fleet targets. So, it's a necessity to achieve the launch dates, but it's well on the way," Diess told analysts at VW's headquarters here last week. The EU is asking automakers to reduce fleet CO2 emissions to 95 grams per kilometer by 2021. In China, expected to be the most important market for EVs, particularly for the I.D. SUV, regulatory requirements foresee fuel consumption of just 5 liters per 100 km, which is roughly equivalent to 117 grams. Volkswagen Group China boss said the China target will be difficult to achieve because there is no market for diesels in China and sales are skewed towards longer and taller cars such as SUVs that are heavier and less aerodynamic. "This five-liter target is as challenging as the 95 gram CO2 target in Europe for 2020. In addition, China is on the way to implementing really the most challenging emission regulations worldwide," Heizmann told analysts. Volkswagen has committed itself in China to selling about 400,000 so-called New Energy Vehicles (NEV) in 2020 consisting of a mix of pure-battery cars and plug-in hybrids with the number growing in the years thereafter. Diess said China will be "our volume base and scale base for all the electric vehicles we are doing." "We have to sell there close to 1 million electric vehicles by the year 2025 — just Volkswagen — and from this volume base we can really do something in the rest of the world," he said. VW Group's other brands including Skoda, Seat and Audi are working on their derivatives that will be built off the MEB architecture that VW is developing for the group. Thanks to the volumes that the VW brand expects from MEB, it should be able to earn a decent margin. "I am confident that already the first cars will be profitable, not hugely profitable but profitable, and the later-coming, more SUV-based, bigger cars should achieve good returns on investment and also good margins," Diess said.